A final echo of the ASIA 2018 tour: Yuja Wang, Jaap van Zweden, and the Orchestra rehearse Prokofiev’s Piano Concerto No. 3 (Andante – Allegro) in Taipei’s National Theater & Concert Hall. Music Director Designate Jaap van Zweden and the New York Philharmonic were triumphant in back-to-back performances in Taipei, the last city on the ASIA 2018 tour. Pianist Yuja Wang joined the Orchestra for landmark concertos by Brahms and Prokofiev, and the Maestro led the Orchestra in symphonic masterworks by Stravinsky and Mahler. 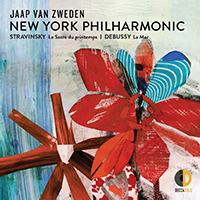 Jaap van Zweden and the New York Philharmonic traveled to Japan for four concerts in three cities — Kyoto, Tokyo, and Nagoya. In addition to concerts with pianist Yuja Wang and violinist Ryu Goto, featuring works by Brahms, Mendelssohn, Stravinsky, and J. Wagenaar, the Music Director Designate and Orchestra were joined by Philharmonic Patrons and members of the International Advisory Board. Music Director Designate Jaap van Zweden and the Orchestra rehearse the rousing “Ride of the Valkyries” from Wagner’s Die Walküre in Beijing’s picturesque National Centre for the Performing Arts — which opened in 2007 and is colloquially known as The Giant Egg — as a possible encore that evening. It’s a good thing, too: the audience demanded more and were treated to this! The March 8 and 9 concerts, presented by China Merchants Bank, opened the Philharmonic’s ASIA 2018 tour. The New York Philharmonic’s ten-day, five-city ASIA 2018 tour — Music Director Designate Jaap van Zweden’s first international tour with the Orchestra — has begun in Beijing. After a day atop the Great Wall, the Orchestra performed two concerts presented by China Merchants Bank, featuring pianist Yuja Wang, violinist Ryu Goto, and orchestral masterworks by Mahler and Stravinsky. The soloists on the tour are Beijing-born pianist Yuja Wang (performing Brahms’s Piano Concerto No. 1 and Prokofiev’s Piano Concerto No. 3) and Japanese-American violinist Ryu Goto (performing Mendelssohn’s Violin Concerto). Jaap will also conduct Stravinsky’s The Rite of Spring (which New York audiences will get to hear in his opening concerts as Music Director in September), Mahler’s Fifth Symphony, and J. Wagenaar’s Cyrano de Bergerac Overture.